A dual fixture kit featuring a pair of our 2' LED Marine Utility Lights, external AC to DC driver, Y-cable, and two 10' extension harnesses. 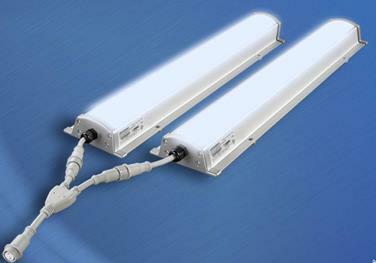 The first genuine LED solution for 2' fluorescent "shop" fixtures. Each light providing greater light output with reduced power consumption than the legacy fluorescent fixtures. Switching to these LED fixtures eliminates maintenance and carrying costs associated with changing mercury-containing bulbs, hazardous recycling costs, and the need to carry spares. An excellent choice for utility & maintenance rooms, engine rooms, generator spaces and bilge areas & holds.